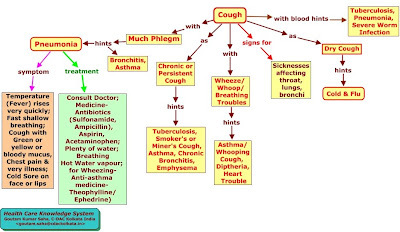 Pulmonary infections occur when normal lung or systemic defence mechanisms are impaired. Primary defences of the respiratory tract include; the mucocilary escalator, flushing action of saliva, cough reflex (impaired in stroke, brain tumours, laryngeal cancer etc. ), filtering by nasal cavity (nasal hair), phagocytosis by alveolar macrophages and normal flora. When presented with a pulmonary infection, cough is often a common symptom. 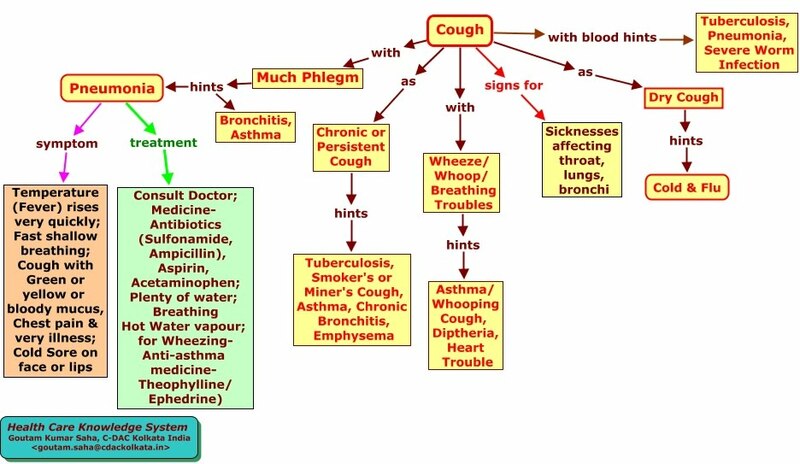 A number of diagnoses can be derived from the symptom of cough, and are summarised in the figure below. In response to last Friday's case 'An unwelcomed pulmonary Tourist' the clinical presentation and associated history would favour the diagnosis of Pneumonia. Described as the "captain of the men of death" by Sir Willian Osler, Pneumonia at the simplest level is a inflammatory condition of the lung. 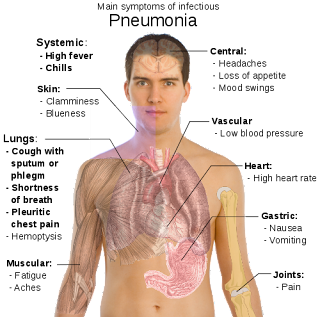 Pneumonia can be caused by a variety of viruses, bacteria, and sometimes fungi. Pneumococcal pneumonia is caused by bacteria called Streptococcus pneumoniae. S. pneumoniae is also called pneumococcus. Treatment is often based on the type of Pneumonia, but antibiotics are typically prescribed. Heckerling PS, Tape TG, Wigton RS, et al. (1990). "Clinical prediction rule for pulmonary infiltrates". Ann. Intern. Med. 113 (9): 664–70. PMID 2221647.